It's not that it hasn't been done before. Artists do covers of their favorite songs both for studio recordings and live performance all the time. Some may even try doing an entire album. But covering an album as iconic and revered as Pink Floyd's progressive rock masterpiece The Dark Side of the Moon takes some bravado. It's been done before with a modicum of success (or failure) depending on your opinion. There was the Billy Sherwood organized Return to the Dark Side of the Moon: A Tribute to Pink Floyd back in 2006, for instance. Dream Theater has done the album in live shows in the past. Here it's done anew by MusicArt Project. MusicArt Project:: the lighter side of the studio. MusicArt is the studio and school formed in 2011 by guitarist Pier Gonella (Mastercastle, Necrodeath). 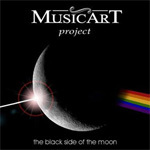 The Black Side of the Moon is the first recording by MusicArt Project, essentially the teaching staff of the school. Their intent was to give a heavier, more metal, interpretation to the seminal album. Generally, concerning the arrangements and melodies, MusicArt varies little from the original album. Essentially, it is what they wished, a heavier Dark Side of the Moon. However, it has some notable features. First, is that all the lead vocals are done by a female singer, namely Mastercastle's Giorgia Gueglio. On the song Time, she's joined by ex-Sadist Zanna who gives the song some raspy male vocals. The real question is whether she can pull off the original improvised vocal work of Clare Torry on The Great Gig in the Sky. Gueglio does a good job, but don't even think of abandoning the original. The second notable item is that The Black Side of the Moon can sometimes, perhaps most of the time, seem like merely another canvas for Gonella's guitar work. Consider the ambitious and flaming solo on Money, and you'll hear what I mean. In the end, The Black Side of the Moon is a curious, heavier, interpretation of The Dark Side of the Moon, but still an enjoyable listen. Mostly, it made me want listen to the original version with a pair very good headphones and a nice pinot noir. MusicArt Project's The Black Side of the Moon is a curious, heavier, interpretation of The Dark Side of the Moon, but still an enjoyable listen. Mostly, it made me want listen to the original version again.